Daniel Thomases, originally from Stratford in Connecticut, USA, is a wine writer and wine critic who came to Florence in the 1970s to write a dissertation in history and then stayed on. We are many who have been there and done that, coming to Florence for a Ph.D. in history or any other subject and then staying on here. 😉 In the 1980s, he met and got to know Luigi Veronelli, who then some time later asked Thomases if he wanted to write for him about wine. Luigi Veronelli was an Italian food and wine critic and intellectual, who strived to promote and protect the Italian oenological and gastronomic culture and tradition. Daniel Thomases has been writing for and contributing articles to different wine magazines in Europe and in the US during the last 30 years, such as the Guida dei Vini of Luigi Veronelli, The Wine Advocate, Wine Spectator, Decanter, and the World Atlas of Wine by Hugh Johnson. Regarding his friendship with Luigi Cappellini, they first met via Luigi’s father-in-law who he told me was a very successful gallerist in Florence. This was before my time in Florence, so I am not familiar with this gallery or people. Anyway, the strong connection between Daniel, Luigi and his wife and family has lasted for many years and one of their main common interests, of course, is wine. 2012 Sassello, had only been aged 6 months so far, therefore it had not been labelled and is not at the market yet. 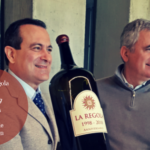 Here I am not going to go into detail about each wine, but focus only on distinct general traits about the vintages and give some background in general about the Sassello wine production. In general, Castello di Verrazzano was one of the first producers to participate in the quality revolution in Italy in the 1970s. 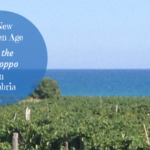 Before that, one had mainly been considering volume rather than quality when it came to wine production in Italy. In that period, it was still allowed to use white grapes in the production of Chianti Classico wines, but this was abolished for Chianti Classico DOCG wines in 2006. 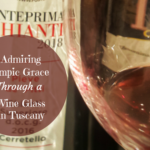 The Gran Selezione that you see mentioned for the 2011 Sassello wine is a new quality level created by the Consorzio Chianti Classico which entered into force in February 2014. This level is above the Riserva wines and it requires an additional ageing of 6 months according to the regulations. The Sassello wine was first produced in 1982 and the Sangiovese grapes are chosen from the Querciolina vineyards on the estate. The Querciolina area is situated 450 above sea level, with a southern sunny exposure and cold during the night. Thus, it gives a very elegant wine. When it comes to the 2011 vintage of Sassello, Daniel Thomases defined it to be fuller in taste with notes of riper fruit compared to the 2012 Sassello. It also felt warmer than the 2012 even though the alcohol level was more or less the same. When we tasted the 2007 vintage, Thomases talked about how those producers who waited to harvest until October in 2007 made a very good wine, as generally it was a year with an early harvest. He continued to describe this vintage as very balanced with notes of violets, a slight smokiness, freshness and a good aftertaste. Regarding the 2006 vintage, Thomases described it as a surprise year as the temperatures had been rising in August and September during that year making the wine producers worried about the lack of rain. However, in mid-September the rain came and the temperature went down. The 2007 has a lot of character but the 2006 has a long way to go and can easily be drunk still for 5 years. However, it has an interesting bouquet with a bit minty and balsamic notes and a feel of the tannins in the aftertaste. This was defined as an unusual vintage by Daniel Thomases, which came after 2003 that had been a year with a very hot summer from May to September. He said that after a very hot year the following is usually then a very productive one. The summer of 2004 was never really hot and had almost no rain, and for those producers who had vineyards on high altitudes they even had to wait until November in some cases to harvest. He defined the 2004 Sassello as being very fresh, aromatic and fragrant with a lovely smoothness to the palate. Then we come finally to the last vintage, 1997, which he said to be very warm (alcoholic) and with the tannins quite rounded off. This vintage is a wine ready to drink now as it will not last for very long. This was a very interesting vertical wine tasting and it was great to have the possibility and the honour to taste so many vintages of the Sassello wine of Castello di Verrazzano and to be guided through the vintages by wine authorities such as Luigi Cappellini and Daniel Thomases. My only comment is not about the content or the quality, how could it be with such a wine writer present, but rather about the fairly traditional structure of the wine tasting. For me, wine is all about the experience through dialogue, communication and interaction. The wine tasting could have been taken to another level and been blown through the roof, especially with so many foreign people present and many of them experts in the sector of viticulture if it had been structured in another way. The focus according to me should always be on the people in front of you inviting them to discuss the wine with you, as you always learn new things that way. Of course, I am aware I am from another generation and might look upon wine from another angle. I’m curious about the term Vertical Wine Tasting. Is this different than other types of wine tasting? Hello Katarina! I’m always fascinated by the incredible life you lead; wine-tasting is always a good day, right? 🙂 I’m definitely not a wine connoisseur–I don’t even know what a “vertical” wine tasting means. However, I love the descriptions of your tasting experience. 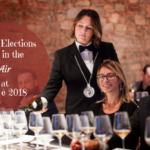 It’s interesting that you mention the tasting could have been improved through interaction because that’s one of my favorite aspects of wine tasting events: the people! You have a special interest and profession that makes me want to start sipping or going to wine tastings. Even though I don’t drink wine, I love your history lessons and the lovely photos. Thanks Roslyn, that’s so sweet of you to say that. And it is a very fun passion, you meet so many nice people and learn so much at every wine tasting. I’m not clear what a “vertical wine tasting” is. Could you explain? I’m not a wine drinking myself but I know serveral people who would are. sharing with them!! Thanks Lisa, that’s so nice of you. What an interesting experience! I don’t know much about wine myself so I really enjoy reading your posts, it makes me feel like I am there! Thanks Alissa, for your nice comment. Wow Katarina, your interpreter gig surely does aid in your wine aficionado-ness (is that a word? lol)… how you get to meet folks doing your job and enjoying your love of wine and food. How awesome is that! Great read. True…:-) it is really great sometimes being able to combine both job and wine passion and have a lot of fun. This must have been an incredible wine tasting experience, Katarina, especially as you were transported through so many years of vintages. One has to develop quite a distinctive palate to be able to taste the subtle distinctions between them. Although I don’t drink wine, this interest and talent you have to share certainly gives a very good picture of the wines you feature. Always sounds like you are having fun as well! Thanks Liz 🙂 …happy you liked the blog article.